From this you can see that you have essentially double the infrastructure that you would have under normal circumstances as you have to account for failover requirements. Need enough capacity on both sites to ensure that in the event of a failure on one site all the VMs and resources can be picked up by the remaining site. The downside to this is that when you buy new hosts you should buy two, one for each site. While it’s not necessary to have both sides balanced with the same number of ESXi hosts it is strongly encouraged. And as the admin of that infrastructure it will make your life easier. I would also be surprised that if a company splashed out for the existing infrastructure that they’d balk at having to purchase double the number of ESXi hosts when you need further compute resources. vSphere HA admission control and DRS affinity rules need to be configured to cater for the needs of vMSC, this is discussed further below. Storage connectivity using Fibre Channel, iSCSI, SVD and FCoE is supported. The maximum supported network latency between sites for the ESXi management networks is 10ms round-trip time (RTT). The maximum supported latency for synchronous storage replication links is 5ms RTT. A minimum of 622Mbps network bandwidth, configured with redundant links, is required for the ESXi vMotion network. Resilient switches on each site, in this case 4 if there are two sites, to ensure switch failure doesn’t impact availability. The networking element is often overlooked but is one of the more complex components of vMSC. For the storage the network requirement is usually dark fiber between sites and for the front-end network used by vCenter the requirement is to have OTV enabled layer-2 encapsulation over layer-3. So what is OTV? OTV is an overlay protocol that encapsulates layer-2 segments into layer-3 packets so that two sites can communicate on the same subnets and IPs as if they were on the same site. OTV can be implemented using high-end switches such as Cisco Nexus 7000. If you’re running a Flexpod environment this is the recommended switch and for most people it will also act as their core switch. Using the Nexus 7000 you can utilise the concept of VDCs (Virtual Device Contexts) to provide flexible separation on hardware resources and to separate the data and control planes. Created a new VDC for OTV ensures that only OTV traffic is handled by that VDC and there is no bleeding across VDCs. Each site had an OTV VDC on each of the Nexus 7000 switches and VLANs that need to travel across sites need to be configured within the OTV VDC. Normal network activity on both sites would run in the LAN VDC. When traffic needs to cross sites such as running a vMotion from one site to the other the request is routed via the OTV VDC which encapsulates the packets and transfers to and OTV on the other site which in turn un-encapsulates and routes the traffic back through the LAN VDC on that site to complete the request. vSphere HA is what keeps the VMs alive in the event that there’s an ESXi host failure. For vMSC VMware recommends enabling vSphere HA Admission Control and setting it to 50% for CPU and 50% for RAM. This offers the most flexibility and reduces operational overheads. Coming from environments where vMSC was not in place this seemed a little bit of an overkill but it means that even if new hosts are added to the environment you don’t need to change the admission control settings to match. 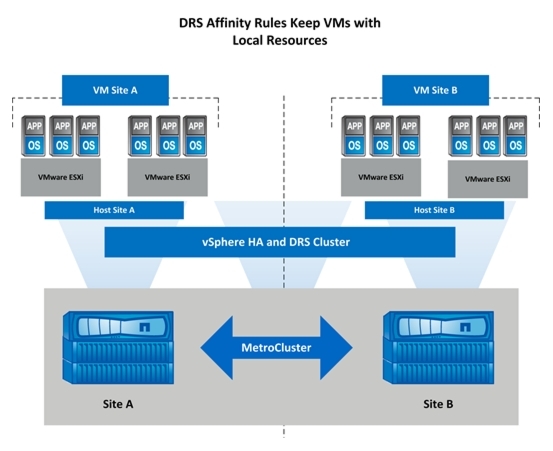 VMware DRS affinity rules to enable a logical separation of virtual machines to ensure that storage and network traffic are load balanced. It also helps keep VMs in the site where they experience the most use. For example, applications on VMs that are primarily used in Site 1 can be configured to have affinity to that site. In the event of a failure they will be managed by HA and when services have been resumed the VMs automatically move back to Site 1 based on the DRS affinity rules. Keeping the VM near to where the primary reads/writes are required also improves the storage performance. 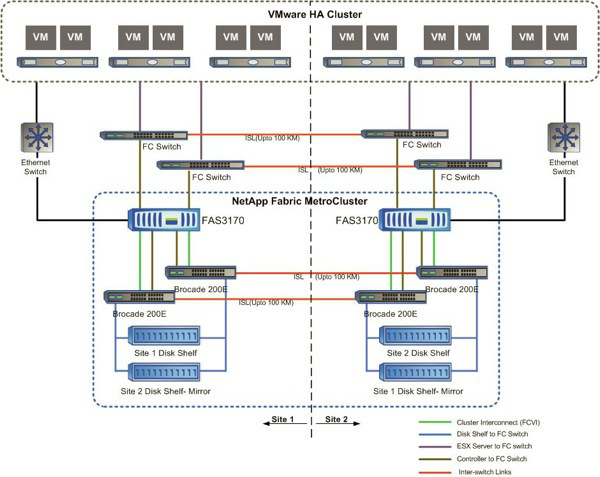 VMware Storage Metro Cluster fits a very specific use-case and requires some very complex infrastructure to be in place to operate successfully. It enables fantastic system availability and while the underlying storage and networking infrastructures are complex the vCenter view appears no different to what the admin is used to and no extra skillset is required for the operations team to manage the infrastructure. Using VAAI plug-ins on the ESXi host offloads some of the heavy lifting to the storage and using VSC (virtual storage console from NetApp) will mean the admin can also manage provisioning and potentially backups via the vCenter console. This entry was posted in MetroCluster, Netapp, vCenter, VMware and tagged ESXi, Metro Storage Cluster, MetroCluster, NetApp, VAAI, vCenter, vMSC, VMware. Bookmark the permalink.